In the book Zakka Sewing, there is a super cute viking key cover made from leather. I mean, this thing is adorable. But it's not the kind of quick project that I like to actually do. Sewing leather is not my thing! Then, the other day, I saw some quilted matroyshka key covers (do you think I could find them again for a link? nope...they seem to have disappeared on me), and got to thinking about what kind of design I might be able to make. 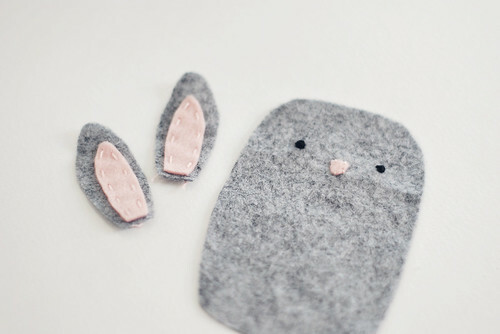 Spring and Easter are not too far off, so a bunny seemed perfect! I referred to this project as a key keeper, but my dad thought that a "key-per" was more appropriate! 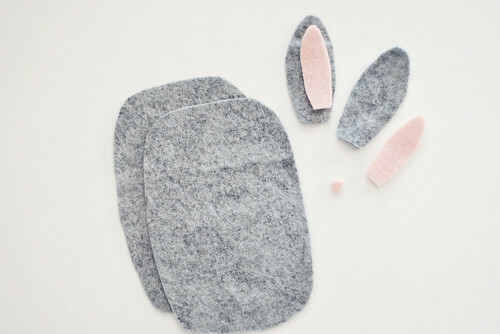 Cut out the pattern pieces from felt. 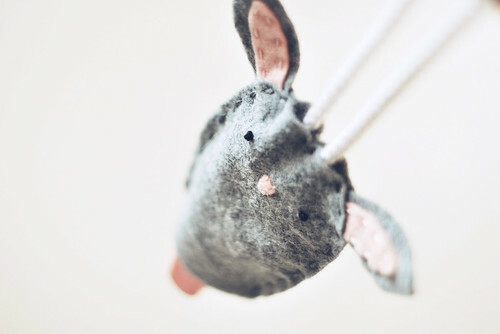 A dark color is probably a good choice, so that your bunny doesn't look too dirty. 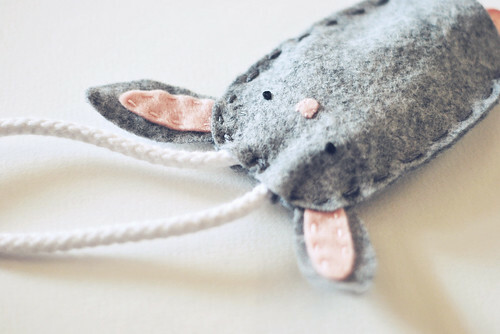 Embroider eyes and applique a felt nose onto one bunny body piece. 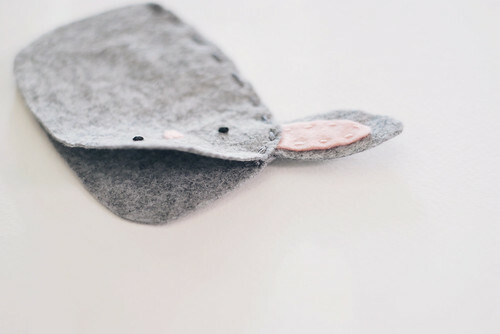 Sew the inner ear pieces onto the outer ear pieces. With a running stitch, sew up one side. Sandwich the first ear between the two layers and sew it in place with this seam. Stop when you reach the top edge. Repeat this with the other side. You should have a large opening at the bottom, and a small opening at the top. 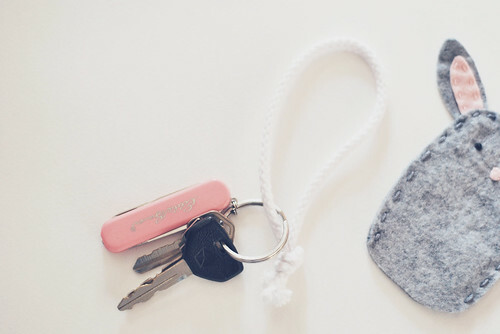 Tie a loop of rope trim onto the key ring. Make sure the knot is tight! Slip the loop up inside the bunny and out through the top opening. Add a stitch between the two pieces of rope trim so that it can still slide, but so that the loop can't fall out. If you carry a lot of keys, this may not be the project for you. You could try enlarging the pattern, but it won't have quite the same effect. I've been thinking that there could be some cute variations on this too. I can picture a monkey keyper, or a lamb! 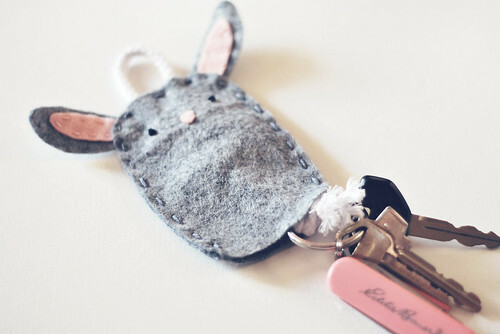 Don't you just need a little animal hugging your keys? Definitely makes an ordinary set of keys much prettier. this is the cutest little idea! without having to have a giant key chain hanging out. Aaaw....so *cute*!! :) Love it, Mollie!! I didn't think I needed an animal hugging my keys until now. 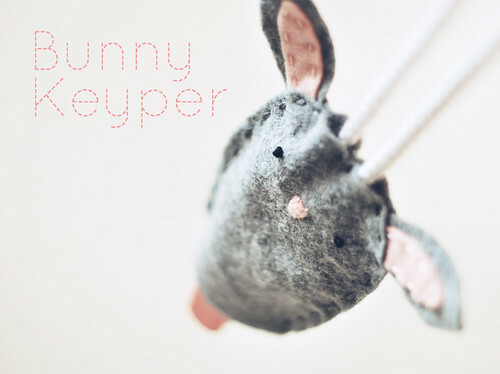 Very cute, and a perfect little bunny for the upcoming easter holiday. Should be a nice add for the basket. Thanks! Very sweet--something new for my "must make list"